In this guide we will consider import of simple playlists in the Excel format. 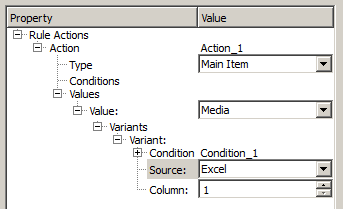 Playlists must be saved in the format Excel 2003 and have the .xls extension. Let's agree that the playlist doesnТt contain secondary events. Choose the menu item File->Open Broadcast List in Air Manager, choose our Excel playlist and press УOpenФ. Notice that the Excel file shouldnТt be opened in other applications. In the opened window we should create rules for import of the Excel playlist. Rules are created once and are further used for import of similar playlists. During the import of a simple playlist the sense of rules is in adjusting the columns in the Excel file with the columns of the Skylark playlist. Press the button Add in the right part of the window to add a new rule to the rule tree. Open the appeared element Action by pressing the button У+Ф. Choose the item Main Item from the drop-down list opposite the word УTypeФ. Choose the item Values and press the button Add to add a new value. Open the appeared element Value by pressing the button У+Ф. 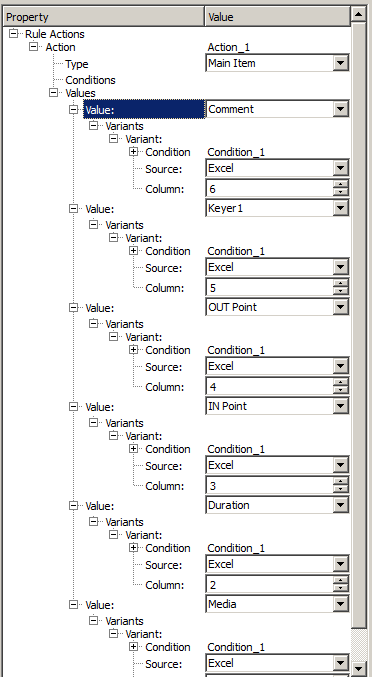 From the drop-down list opposite to the element Value choose the column of the Skylark playlist, for adjusting with the column of the Excel playlist. Choose Media. Choose the item Variants in the tree and press the button Add to add a variant for the value. Open the element Variants by pressing У+Ф and see the appeared element Variant one level lower in the tree. Open it. 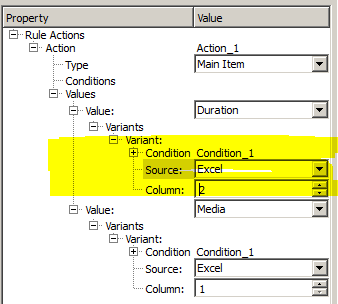 Opposite the element Source choose the item Excel from the drop-down list, then choose У1Ф near the appeared element Column. With these actions we've correlated the first column of the Excel file with the column Media of the Skylark playlist. LetТs correlate the second column of the Excel file with the column Duration of the Skylark playlist in the same way. Opposite the appeared element Value choose the item Duration from the drop-down list. 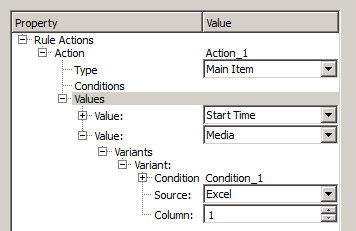 Open the element Value by pressing the У+Ф sign and add a new variant of the value: source - Excel, column У2Ф. You should notice that cells of the Excel playlist that contain duration of video clips, may have the format УTIMEФ and be set as HH:MM:SS (i.e. without frame-by-frame accuracy), or may have the format УTEXTФ and be set as HH:MM:SS:FF (with frame-by-frame accuracy). Air Manager can import both types. LetТs use the same way to correlate the rest of columns in the Excel playlist with the columns of the Skylark playlist ЂIn Pointї, ЂOut Pointї, ЂKeyer 1ї and ЂCommentї respectively. Save the created rules by the button УSave ruleФ. You can download the demo Excel playlist and the rules for its import.